In enterprises small or large, plethora of mobile devices are used by employees to be productive and competitive at the workplace. The anywhere and anytime access to corporate resources from such mobile devices has introduced significant threats to corporate security and management challenges that traditional security solutions fail to address. Moreover, the threats are magnified with option to bring-your-own-device(BYOD) so that employees can access company data using their personal gadgets. Identify the growing number of device models, platform and operating systems versions available. With private cloud file sharing, enterprises have taken a major step forward by moving to an on-premise, self-hosted private cloud solution such as FileCloud. In the process, they have secured their data from public cloud solutions such as Dropbox. However, situations such as an employee leaving the organization or an employee losing their mobile device, create security threats when access to enterprise data is not completely terminated. Hence, enterprises need a tool to control not only the access but also make sure any cached copy on the unauthorized devices are removed on-demand. Private Cloud File Sharing with MDM Built-In: Find a private cloud file sharing solution that already has MDM built-in. Installing a separate software creates another layer of IT overhead with respect to system maintenance and costs related to people and licensing. Although, there might be some organization that might choose this option, but its not for everyone. 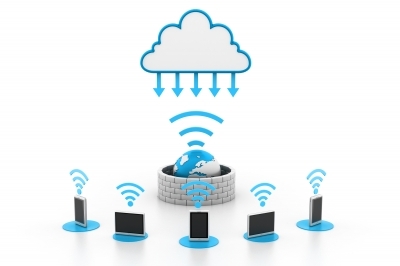 The ideal choice would be to pick a private cloud file sharing solution with MDM built-in. Although, the number of solutions are limited out there, we believe FileCloud with MDM built-in is the secure, best bang for the buck solution. FileCloud’s unified device management console provides simplified access to managing mobile devices enabled to access enterprise data, irrespective of whether the device is enterprise owned, employee owned, mobile platform or device type. Manage and control of thousands of iOS and Android, devices in FileCloud’s secure, browser-based dashboard. FileCloud’s administrator console is intuitive and requires no training or dedicated staff. FileCloud’s MDM works on any vendor’s network — even if the managed devices are on the road, at a café, or used at home. Administrator can selectively block a specific client device from logging into the FileCloud server. In addition to blocking a client device from logging in, administrator can also wipe FileCloud folders in the remote device. Ability to send on-demand messages to any device connecting to FileCloud, provides administrators a powerful tool to interact with the enterprise workforce. Any information on security threats or access violations can be easily conveyed to the mobile users. And, above all messages are without any SMS cost. FileCloud captures detailed information on user access. Administrators can clearly see what device a user is using to connect to FileCloud and information such as IP Address, User Agent, etc. If administrators determine a particular version of the mobile OS has some security threats, they can easily identify the users running the OS version and block access. As MDM is tightly integrated to FileCloud, a private cloud offering, one doesn’t need to install a separate software to manage mobile access. No separate software installation, no separate license maintenance, and no security head aches. 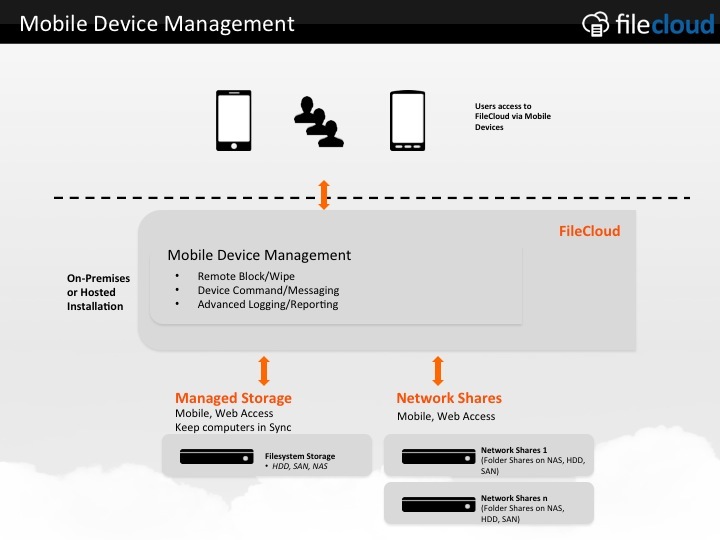 The below video describes how easy is to manage mobile devices connecting to FileCloud. Alternative to Citrix ShareFile – Why Tonido FileCloud is better for Business File Sharing?